Hillcrest has become the latest organisation to sign the UK Armed Forces Covenant – a commitment to support the Armed Forces community wherever and whenever possible. We join more than 3000 UK organisations who have now put pen to paper, pledging to do their part. 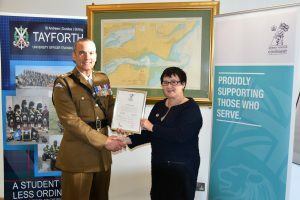 The document signing took place at Hillcrest’s Dundee HQ, and was co-signed on behalf of the Ministry of Defence by Lt Col Al Jarvis RE, the commanding officer of Tayforth Universities Officers Training Corps. Promote that we are an armed forces-friendly organisation. Support employees who choose to be members of the reserve forces, including accommodating their training and deployment where possible. Aim to actively participate in Armed Forces Day. Endeavour to offer a degree of flexibility in granting leave for service spouses and partners before, during and after their partner’s deployment. The Covenant signing was organised by the Highland Reserve Forces’ and Cadets’ Association, and attended along with signatories by Regional Employer Engagement Director Michelle McKearnon.